Allen’s Lollies and Peter’s Ice Cream have partnered again, this time for an ice cream inspired lolly range. The new range includes ‘Allen’s inspired by Peters Frosty Fruits’ with tropical, watermelon & pineapple and orange & grapefruit flavours. It also includes Allen’s inspired by Peters Drumstick with vanilla, chocolate and boysenberry. Both Allen’s and Peters are brands originating from Australia but are today under foreign ownership. Allen’s is owned by Nestle and Peters is owned by UK ice cream producer, R&R. Nestle General Manager of Confectionery, Martin Brown, said the experts at Allen’s have worked tirelessly to bring the flavours of Peters ice cream to the confectionery aisle. “Allen’s and Peters are both iconic brands that ignite fond memories for Aussies, from childhood moments of fun, to summers at the beach and road-trips with friends,” Brown said. Peter’s Director of Sales and Marketing, Emma-Jane Collins, said Peters is just as excited about the collaboration as Allen’s. 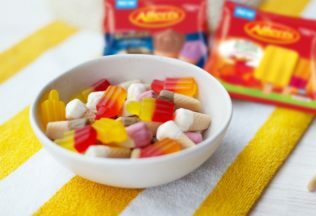 “We love that the new Allen’s inspired by Peters lollies are a great representation of our existing ice cream products and are true to their flavour delivery,” Collins said. Allen’s inspired by Peter’s Frosty Fruits and Allen’s inspired by Peters Drumstick are available now in 170g packets at Australian supermarkets and convenience stores. The recommended retail price is AUD $2.99 per 170g serving.